Abstract games have been around since the dawn of board games. Chess and Go are classic examples of this genre. They are both strategy games that eliminate luck, yet also don’t have strong themes that connect with the game play. Recently, there is a movement to add a little more theme to abstract games, but also keep the strong strategy element in the game play. Games like Hey, That’s My Fish, Tash-Kalar, and Tsuro fall into this new category. Today’s preview of Lineage falls into the second grouping of games. 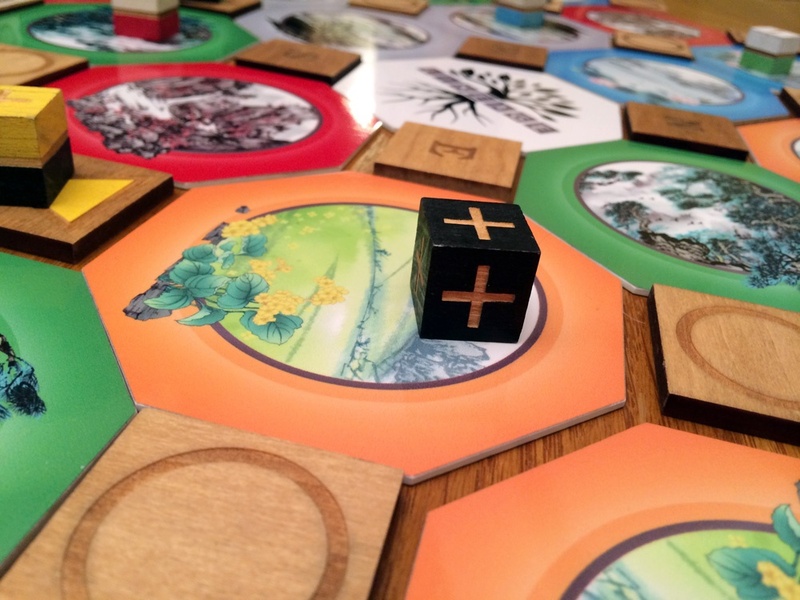 Lineage, now in funding on Kickstarter, is a semi-cooperative game deeply rooted in Chinese philosophy, concepts of Yin and Yang, the four seasons, Chi and the eight directions. Let’s start dissecting what this game is all about to see if it would fit nicely into your gaming collection. 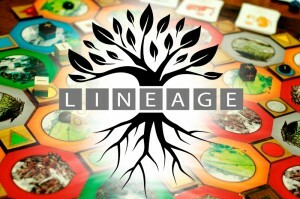 Lineage is an abstract strategy game for 2-6 players that plays in about 60 minutes. Lineage plays best with 4 players. 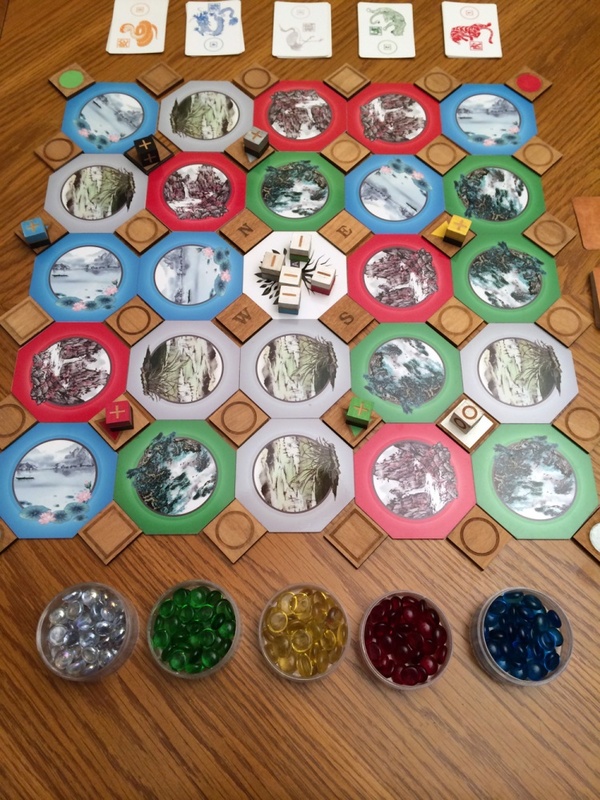 Even though this is a prototype, the components are going to be amazing for this game. In Lineage, one player will control the Emperor and General tokens, while the rest of the players control their own set of Master and Student markers. The Emperor and General player is attempting to unify the people under one banner by claiming the four spots on the corners of the game board. The Master and Student players must work together to stop Emperor and General player from winning the game, while at the same time battling each other to be the first one to have their Students become a Master and meet at the center of the board. The Student tokens must move around the board to train with other player’s masters to gain the knowledge necessary to become a Master on their own. The game has a high level of player interaction with a board that constantly changes. The game is all about thinking a few steps ahead of the other players to gain that crucial edge. The modular game board consists of octagonal tiles and square tiles. Around the center tile will be four different colored octagonal tiles each, one representing one of the four seasons. 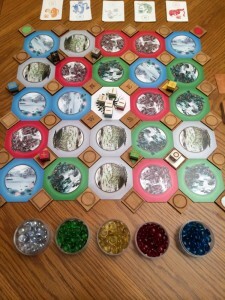 In between the season tiles connected to the center tile are directional markers showing N, S, E, & W. The board expands to two more concentric rings around the center tile with more season tiles. Each of the season octagonal tiles has an image of a field on the opposite side. This is the only type of terrain that the General can move across. Once these are placed on the table, the rest of the square tiles are placed to fill in the gaps in the game board. These tiles represent cities, palaces, and temples that will gain a player one of the five types of chi that they can use for extra movement and other influencing actions. Advancing up to higher levels of training is the main goal of Master and Student players. There are also a specific deck of cards for each tile type that affect things like what Chi can be used (city), ability to flip over season tiles (palace), and change the seasons (temple) when a player ends their turn on one of the tiles. The only other tiles on the board are the reversible Yin Yang tiles that, depending on the combination, will determine which player tokens can be moved. When both are black, only the Masters and General tokens can move and when they are only white, Students and the Emperor can only move. When one of each is showing, ever player piece can be moved on that turn. The game starts with each player’s Student token, one with the “-” symbol, on the center tile. The Masters start on the temple tiles that match their color discipline. The last thing involved with the game is the animal decks that are placed to the side of the board. There are five types of animal cards in the game and each set of animal cards has five cards with numbers 1 through 5. These are all separated into five piles based on their numerical value. 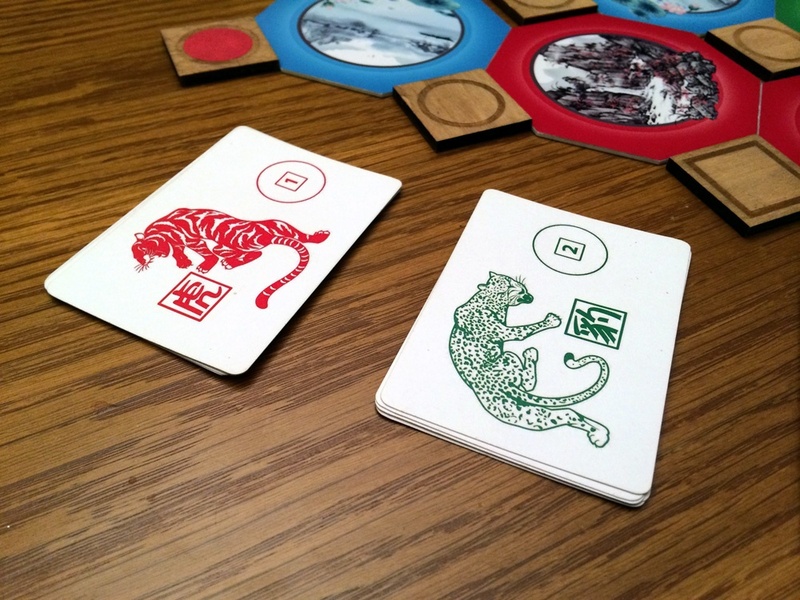 At the start of the game, players will be attempting to receive training from the Master token that matches the color of the animal. If a student ends their turn on the same location as a Master token, they will earn this card and will be able to move on to the next deck of cards. 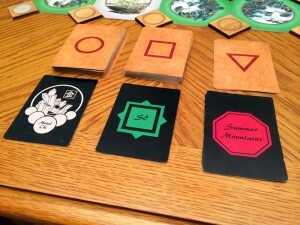 Once a player has earned a card from each of the 5 decks of animal cards, they become a Master and can win the game if they and their Master make it back to the center tile. Ok, enough with the info dump and onto the game play. Despite all the stuff above, the game play is actually very simple. 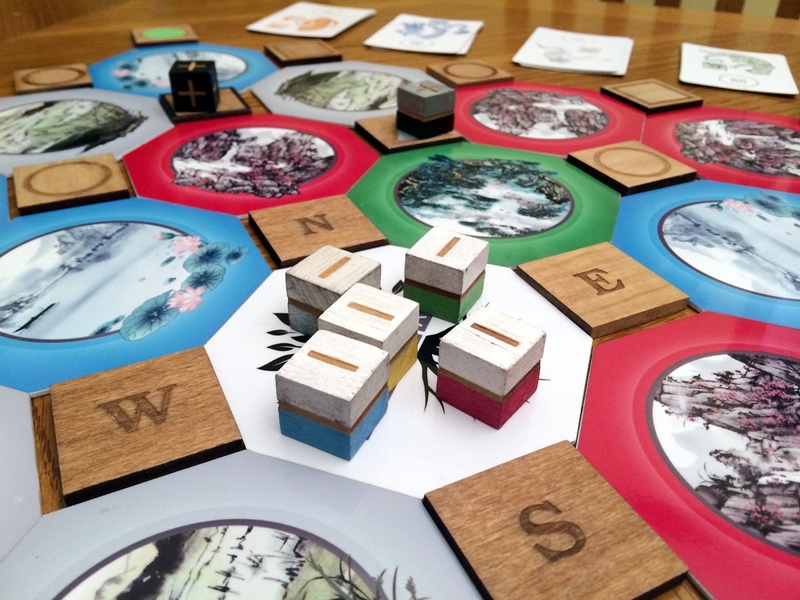 Each turn Student and Master players will move one of their pieces around the board and if they land on a square tile, they will interact with it. They will spend chi that they have earned in order to help themselves get to the next master they need to train with, or hinder the players. The Emperor token will move around the board flipping tiles over to the field side, allowing their General to move around the board to claim the corner city tiles. That is the basics of the game play. There are more small rules that are explained in the rulebook that I won’t explain further here; because I want to tell you how interesting the game is to play. Student tokens start at the center tile and fan out to train with Masters of the different disciplines. When I first got the prototype for Lineage, I was blown away by the component quality. I know we normally don’t talk about components in previews because the game isn’t final, but wow. The amazing artwork on the season and field tiles and the way that the game looks when all the bits are put together is quite impressive. The conditions constantly change in Lineage, forcing players to adjust their strategy constantly. Like I said above, the actual game play is rather simple. It’s all about moving your pieces to achieve your goal. I like how the game has an all vs one aspect. The Emperor and General can cause a lot of havoc on the game board because they can make some sections impassable. It gives each of the other players another thing to think about during their turns while trying to reach their winning condition. If left unchecked, that player can quickly claim the necessary spots to win the game. There are two major things that I think make this game enjoyable. First are the constantly changing conditions on the board. Each time that a player ends their movement on one of the square tiles, they get to affect the game. The city tiles are the most common square tiles and will allow players to change the type of Chi players can use until another player ends their turn on that space. This is useful if another player earns a lot of Chi and you can make it almost worthless if the card you draw doesn’t match that color. The palace tokens are great for players to mess with the Emperor and General player. There is some randomness with this deck of cards because they show a direction and it is that line of tiles that you can flip over. But I like that it is so easy to change a tile from one side to another. The season deck that players use when they land on a temple card is by far the most game changing for me. This deck of cards is only four deep, but each one makes six of the octagonal season tiles blocked from anyone using it. This is such a great mechanic. You can essentially stop player’s movement in their tracks or make it impossible to reach a master because of this. All of these elements work nicely together to make each game unique and almost each turn different than the last for the players. Having a separate win condition for the Emperor and General player add some variety to game play. The other interesting aspect of this game is how Master and Student players gain animal cards to progress toward becoming a master. In a full six player game, each of the Master tokens will be controlled by a player. That means that in order to progress onto the next deck of cards, you will have to race the other players to get to that Master first, which is controlled by another player. This adds another layer of decision making for players to make. They must abandon their own search to keep their Master token out of reach of another player. This is where players who control Master and Student markers will fight each other to move up on the track. Those once strong bonds to keep the Emperor at bay will quickly fall away as you try and mess up other players well laid plans. I think this game is best with the higher play counts. When Masters are not controlled by players, they are just sitting at temples’ waiting to train anyone that stops by. Having those pieces move around the board makes it much more difficult to get your Student trained. You have to be thinking a move or two ahead to get that animal card. Every element in Lineage is dripping with strategy. There is very little luck in Lineage and each time you move your player, it can cause a ripple effect that changes the game for the next player down the line. You are constantly weighing options in your mind before you make a decision. 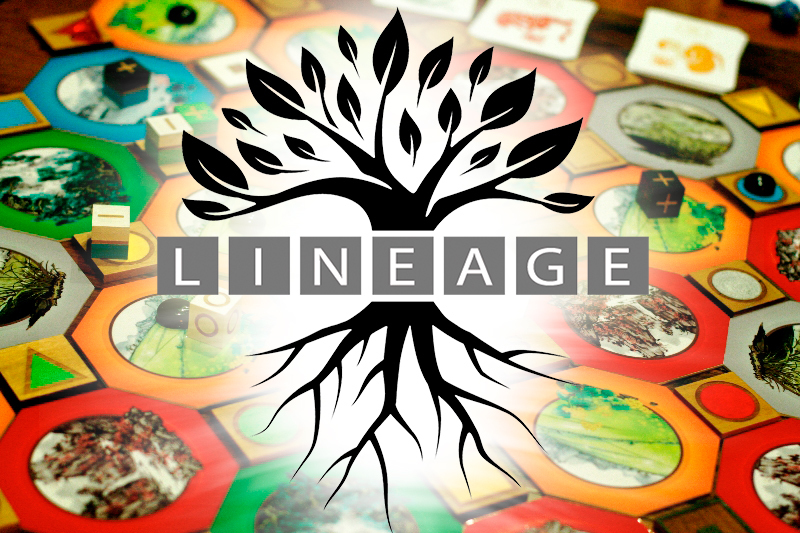 The game is going to be shipping with excellent components and if you are a fan of heavy abstract strategy games, consider giving Lineage your support. If you are interested in the game, it’s currently funding on Kickstarter and scheduled for delivery in February 2015. A pledge of $39 will get you a copy of the game and any stretch goals. You have until Tuesday, April 1st to become a backer so head over today if you are interested.